We’re all familiar with the regular old pigeon, but have you ever wondered how the species became so prolific? And, did you know that there is a pigeon species that is native to parts of California? Common pigeons, also known as rock doves or wild pigeons, were first brought to America by Europeans. When they first arrived, they were domesticated birds, as in centuries past, common pigeons were often used as homing pigeons and carrier pigeons to deliver messages, especially in times of war. Some of the pigeons that arrived in America with the Europeans escaped and developed into vast wild populations, according to a brief history published by the LA County Department of the Agricultural Commissioner, with many of these colonies took up residence areas near parks, cities, farms or mills and more. Common pigeons and band tail pigeons, which are native to parts of California, differ the most in their coloring and look, but their habits also vary greatly. The band tail pigeon is related closely to the now extinct passenger pigeon, and has darker coloring than the common pigeon, according to the California Department of Fish and Wildlife. Band tails also avoid living in or on buildings, and generally dislike heavily populated areas, so these birds are not the ones that you commonly see walking around the city. Instead, band tails tend to stick to the foothill areas, and are more likely to land and nest in trees, while the common pigeon tends to prefer telephone wires, building ledges and rooftops, notes Mission Local. For this reason, the common or wild pigeon is the No. 1 urban pest bird. Common pigeons can wreak havoc on your home or business, with not just their wastes, but also their nests, which can lead to structural damage over time. Common pigeons are not afraid of people, so they nest where they please. Their short legs, combined with the unique shape of their feet, allow the pigeons to perch and walk on almost any flat surface. Debris from roosting flocks can build up and clog drains and gutters, which can cause lasting water damage to your roof and home. Plus, pigeons carry many pests and diseases that are harmful to humans. Needless to say, a pigeon nest at your home or business is not ideal. 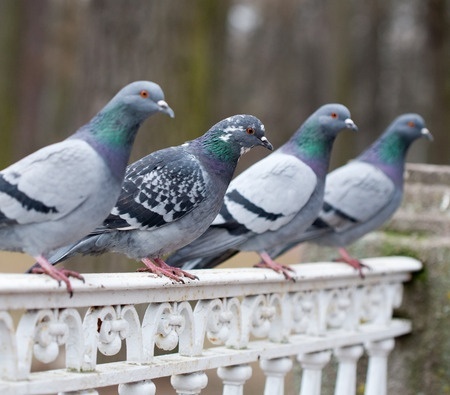 The easiest way to deal with a pigeons is to prevent them from roosting on the structure in question. Here at Birds Away/Pigeons Away, we do this by installing one or more of the following deterrents; wire mesh, pigeon exclusion netting, stainless steel wire prongs, coil wire, spring wire or non-harmful electric tracks. We offer a full range of services for both commercial and residential clients, and no matter the extent of your pigeon or other pest bird problem, our team can provide a solution for you. To learn more about how we can help, call us today at 925-798-9041.